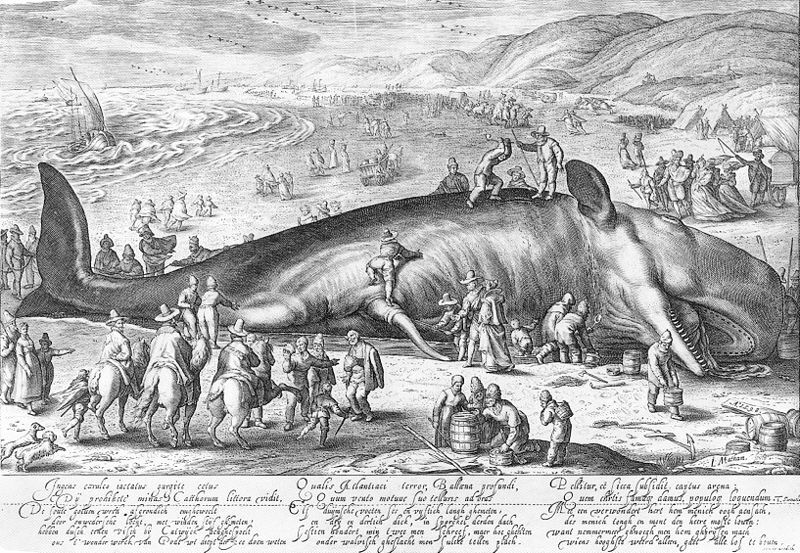 So reads the Latin text accompanying a late sixteenth-century engraving of a beached whale on the Dutch coast. 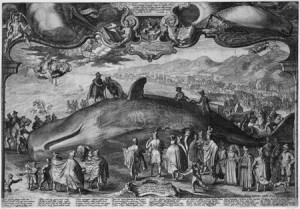 While it may seem a peculiar subject for artistic representation, prints, as well as drawings and paintings, of stranded whales proliferated in the Dutch Republic in the late sixteenth century and first half of the seventeenth century. Between 1521 and the end of the seventeenth century, there were at least forty instances of whales becoming stranded on the coasts of the Netherlands, the likely explanation being the treacherous nature of the North Sea coastline for the enormous mammals, whose echo-sounding system was possibly disrupted by the muddy, sloping shore areas. Among the better known artists to treat this subject was Hendrick Goltzius, whose drawing of 1598 depicts people of all classes coming to view the sperm whale on the beach near Berkhey. 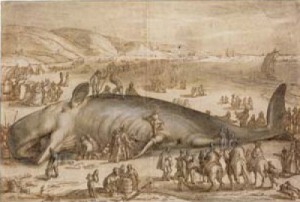 Goltzius’s drawing reveals some anatomical inaccuracies, such as mistaking the whale’s fin for an ear, suggesting he made sketches on the beach and then c ompleted the drawing in his studio. This particular image became very popular in the Netherlands and beyond: Goltzius’s stepson Jacob Matham reproduced the drawing in print form, and in 1601 a copy was published in Rome that purported to depict the beaching of a sperm whale near Ancona, on the Italian coast. The image also became an obligatory feature of contemporary Dutch histories. 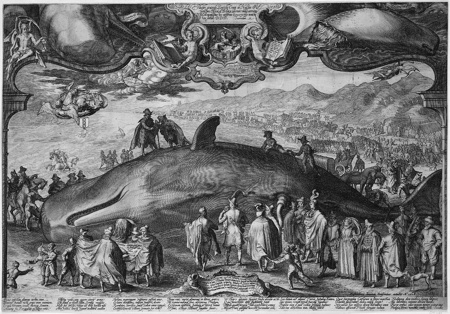 In 1617 Willem B uytewech produced an engraving of a beached whale that was later painted by Esaias van de Velde. While some images of stranded whales have an allegorical or metaphorical quality—which we will return to shortly—Buytewech’s print is more reportorial and immediate in nature and suggested to the viewer that the event was witnessed by the artist himself. 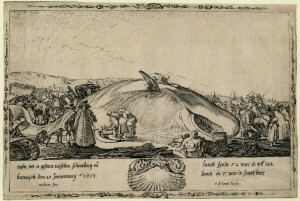 The most ambitious and elaborate of the numerous Dutch prints made of beached whales is Jan Saenredam’s Stranded Whale near Beverwyck of 1602. This engraving surpasses all other prints of the subject in its sense of spectacle, with its great marching throngs of curious spectators, high panoramic viewpoint, and dramatic sky. 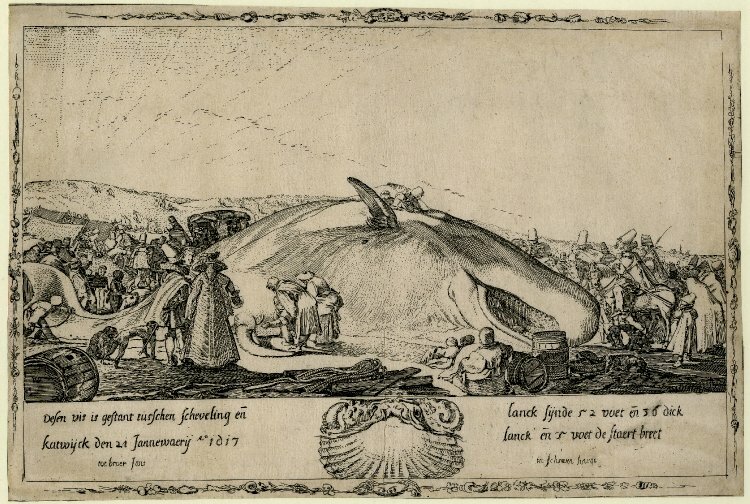 Saenredam went to great lengths to assure the viewer of the accuracy of his reporting: the Latin inscription at the top provides the date and location of the event, as well as the whale’s measurements, and states that the artist has reproduced the whale’s proportions and parts with geometrical exactitude. While observers were careful to prod, probe, and measure the helpless creatures, beachings were not merely zoological and arithmetic exercises: they were viewed as significant historical events that did not merely cause concern for the animal’s struggle; many sought and saw deeper meaning, viewing them as “oracular signpost[s]” or portents of impending disaster. 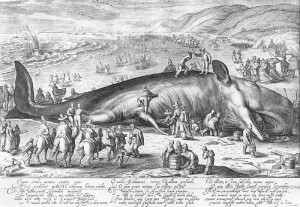 In the seventeenth century beached whales were seen at once as signs of God’s miraculous power and omens of impending doom. For instance, a pamphlet published in 1599 indicates that the 1598 beaching at Berkhey was viewed as presaging the Spanish invasion of the region around Cleves in August of that year. The Latin verses that accompanied these prints often make the theme of the stranded whale as portent of disaster explicit, alluding to past military reversals and natural disasters. The text on Saenredam’s print connects the episode to a series of disasters that occurred between the end of 1601 and the summer of 1602: the port of Ostend was besieged by Archduke Albert’s army; reports from Spain indicated that a grand armada was about to sail for the Netherlands; and there were reports of a solar and lunar eclipse, earthquake, and a severe outbreak of the plague. Like so many other “disaster” prints of the period, Saenredam’s print thus functions as both oracle and descriptive document. It was between 1570 and 1650 that stranded whales really made their mark in prints, verses, and moral-polemical broadsides. This happened to be exactly the formative period during which Dutch culture was shaped by the fears and uncertainties of religious conflict and war. Thus it is not surprising that the beached whale was repeatedly interpreted as commentary on national fortunes or sign of impending crisis. Beached whales also took on theological significance. An impression of Buytewech’s print, executed in 1617—a climactic year in the struggle between Calvinist militants and their Remonstrant opponents—became “a warning dispatched by God against an irresponsible truce and a sinful compromise with the forces of Antichrist.” The whales “incorporated proverb, prophecy, and parable in their disconcerting immensity” and were exploited as a potent reminder of the consequences of disobeying divine law. Not surprisingly, once the Dutch Republic’s place within Europe seemed more secure, stranded whale prints that incorporated oracular commentary appeared with less frequency. Indeed, such prints coincided with the more insecure phase of the Republic’s history. In addition, the magnitude of the whaling industry meant that a naturalistic element in whaling images became more dominant. As whales became seen increasingly as commodities, their capacity as symbols weakened. That said, it would be too simplistic to “imply a cultural chronology in which the whale swims out of the realm of myth and proverbial lore into a scriptural portent-bearing element” and ends up “as the raw material of industrial process.” Nevertheless, it was this this oscillation between reality and mythology, historical episode and oracular symbol, that drew spectators and artists alike to the stranded whales that washed up upon the shores of the Dutch Republic.